These almond flour muffins are a great low carb friendly muffin recipe. This post will tell you why. 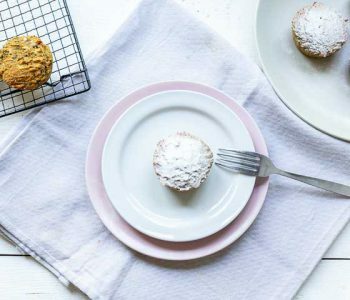 The answer is really easy so are you ready to learn why these are the most surprising almond flour muffins? Lets get started! This recipe happened by chance as I made some home make almond flour a couple of weeks ago and wanted to do something with it. 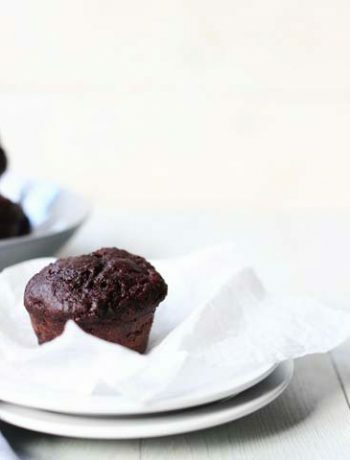 I love muffins so why not make a low carb muffin recipe that was vegan as well? Oh yes no limits to my ambitions. So the ground rules, no dairy or eggs as they are vegan. Low carbs to make the keto and it has to taste great because why else would you want to eat it. As I made a vegan chocolate muffin recipe before that was my starting point but including almond flour raised a different challenge in the mix. Almond flour has no gluten and gluten holds baking goods together. As I made the chocolate muffin recipe with oats I had that challenge before. What worked well in that recipe and in this recipe as well was using banana and apple sauce to bind all my ingredients together. I used apple sauce as a substitute for butter and added some great flavor to these muffins. Now before you read any further and will tell me that banana and apple sauce does not fit the a low carb diet the amounts used are low and the total carb count for this recipe is 7.9 gram per muffin. Still if you do not want to eat banana you can replace it with vegan banana protein powder and water. The carb count will be done to 4.2 gram per muffin. As I seem to be in a chia seeds phase I added some chia seeds to this recipe as well as they added a nice crunch when you take a bite. 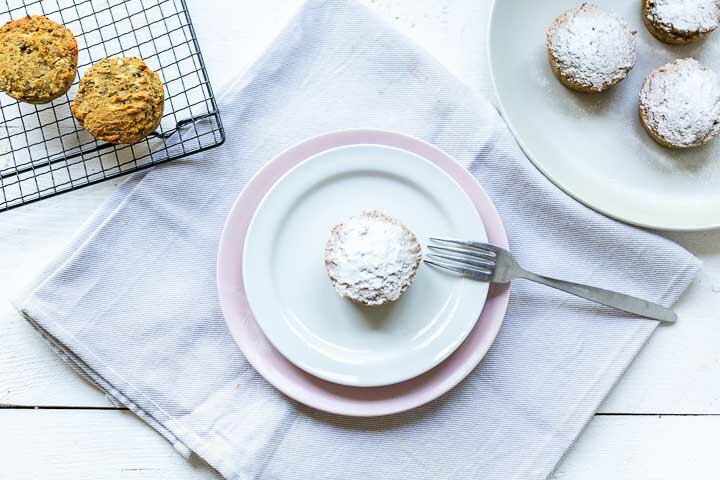 With the combination of low carb almond flour, lemon, chia seeds, banana and apple sauce will give you some great flavors in a solid muffin that you can eat for breakfast, lunch, afternoon tea or even as dessert. Besides baking powder and baking soda I have not used any raising agent like flax seeds or aqua faba. 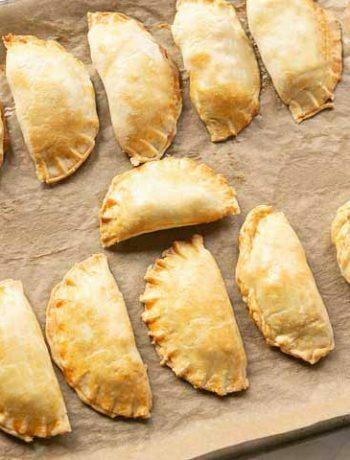 This worked really well and your recipe can do with out it at least in this recipe. Pre heat your oven to 350℉/175℃ before you start out with the wet ingredients by mashing the banana with a fork. I only used one banana in this recipe the riper the banana the more banana flavor your muffins will get. If you do not want to use banana, replace it with banana protein powder. Take about a scoops of banana flavored protein powder and add water until you have thick mixture (start with a tablespoon per scoop and add more if the mixture is to thick). Then add vanilla extract and lemon juice and stir it through the mashed banana before adding the apple sauce. Set this mixture aside. Now mix the dry ingredients in a big bowl. Start with the almond flour then add the chia seeds, stevia powder, baking powder, baking soda and salt. Stir through thoroughly to combine all the ingredients. Take the wet mixture and add it to the dry ingredients and mix it through with a fork or spoon. You will get a sticky solid batter. I use a ice cream scoop to fill my muffin tin but a spoon will do use fine. I do not use any baking product to line the muffin tin. The batter goes straight into the tin but you can use paper muffin shapes if you like. They will come out easier when they are done. This recipe yields six muffins. Press the batter into the muffin tin and put the muffin tin in the oven for 20-25 minutes. Check with a tooth pick to see if the almond flour muffins are done. Let them cool before taking them out of the tin. I use a cooling rack to let them cool completely before serving. 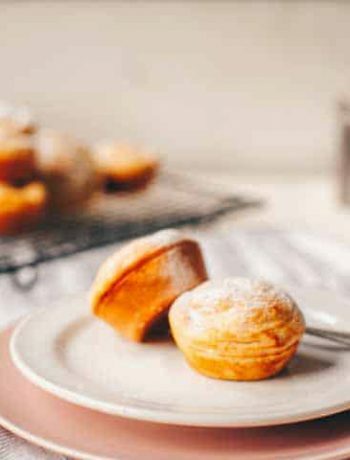 You can sprinkle some icing sugar on the muffins which is optional and not really low carb so omit if you are on a low carb diet. Have fun making these low carb almond flour chia muffins! Made a recipe tag @thetortillachannel on Instagram or PIN to Pinterest. Almond flour muffins are great low carb muffins that fit perfectly in a keto diet but also in a vegan or plant based diet. A great recipe for muffin lovers. Mash banana with a fork. Then add vanilla extract and lemon juice. Stir it through the mashed banana before adding the apple sauce. Set this mixture aside. If you do not want to use apple sauce you can replace it with (vegan) butter the carb count will go down to 2.4 grams per muffin.